Ready to homeschool with the LIFEPAC curriculum? Hunting for a helpful resource that will explain this Alpha Omega curriculum and give you teaching advice? If so, you need A Parent's Guide to Mastering LIFEPAC Management! This soft-cover guide offers a complete overview of the LIFEPAC curriculum, grade levels and subjects, and more! Are you eager to start homeschooling your child with the LIFEPAC curriculum? Need a homeschool resource that will show you how to use the LIFEPAC curriculum? If so, Alpha Omega Publications has just the tool you've been looking for—A Parent's Guide to Mastering LIFEPAC Management! This invaluable soft-cover guide is filled with helpful information to assist parents with the day-to-day procedure of a homeschool program using the LIFEPAC curriculum. Divided into three sections, this guide, made for beginners and experienced teachers alike, offers a complete overview of the LIFEPAC curriculum, information on grades and subjects, and a What to Know About section packed with valuable, in-depth tips and advice on homeschooling. Sounds great doesn't it? But wait, there's more! 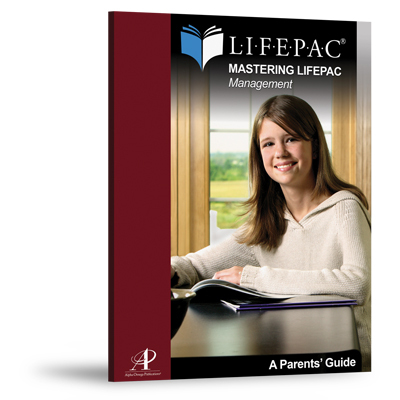 A Parent's Guide to Mastering LIFEPAC Management will fully explain the LIFEPACs design, diagnostic tests, self tests, and teacher's guides in a step-by-step manner, complete with detailed descriptions and actual sample pages. How convenient is that? And this handy Alpha Omega curriculum guide also covers grade levels PreK-12, methods for teaching spelling, resource book ideas, math solution keys, and penmanship programs. Brimming with useful homeschool advice, this informative guide also offers information on graduation and credits, classroom management, answer keys, reading and extracurricular activities, motivation and discipline, and elective options! Sound like a lot? And that's only the half of it! So if you're looking for a detailed explanation of the LIFEPAC curriculum, add this guide to your teaching resources today. Don't wait, order A Parent's Guide to Mastering LIFEPAC Management now!